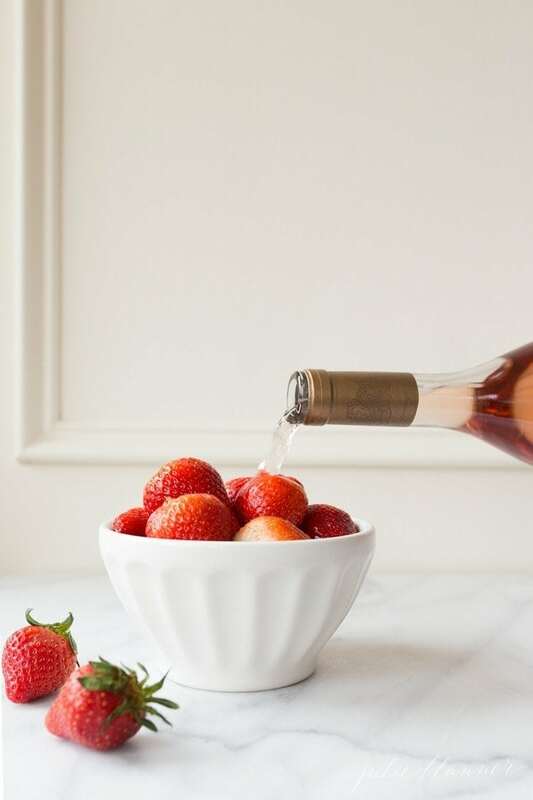 Recipe for Drunken Strawberries, Rosé Strawberries or Wine Marinated Strawberries. Whatever you want to call them, you’ll be calling them the perfect summer treat! 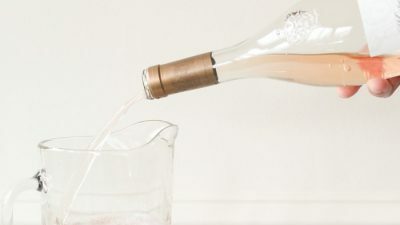 As I was pouring rosé into a pitcher to make a batch of rosé slushies the other day, I had an idea. 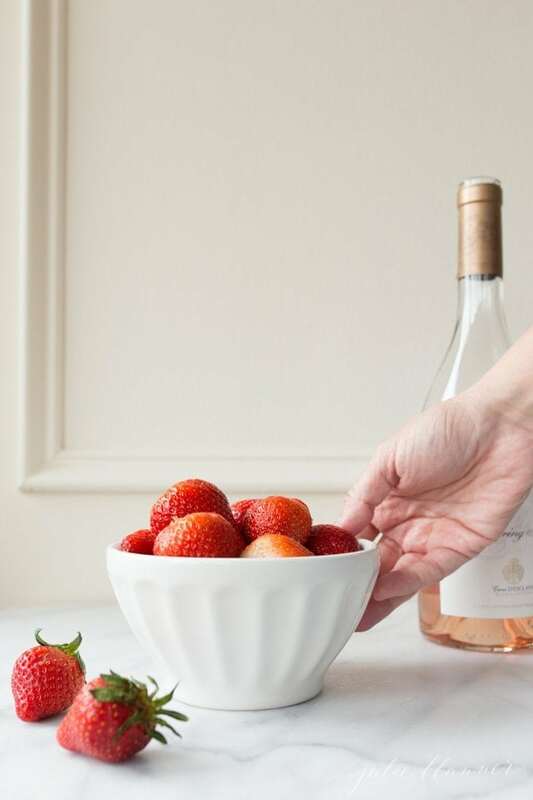 What if I made my wine marinated grapes, with strawberries instead? Then I called my friend Christina over because it’s always more acceptable to drink in good company, right? Well, we spent the day making drunken strawberries and photographing them for you. Okay, it really only took 5 minutes to make them, but we were chasing toddlers, comparing notes, and having fun. 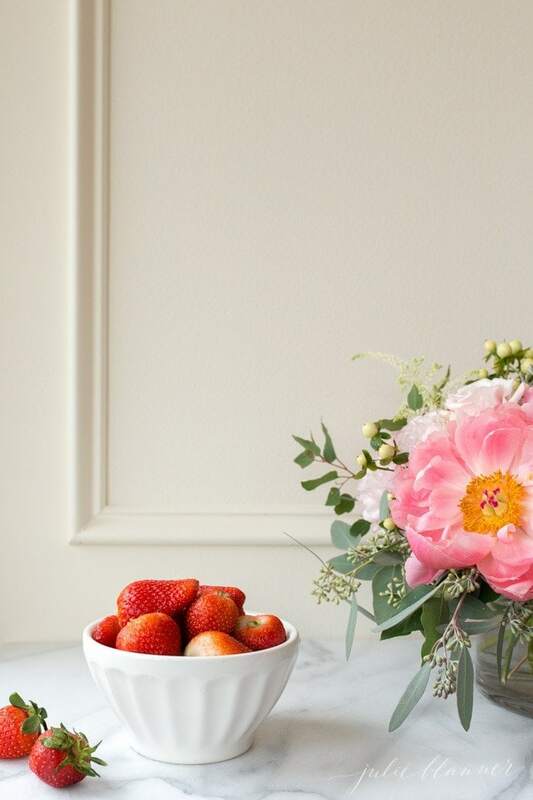 Anyways, I know you’ll love these rosé strawberries too. A couple years ago we did a rosé tasting in Sonoma with friends. 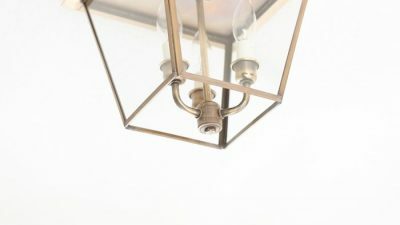 I had occasionally had a glass of rosé that I enjoyed, but more that I didn’t. It was fun to do a side by side comparison of rosés to see what it was I did and did not like. Of course the views and great company didn’t hurt either. 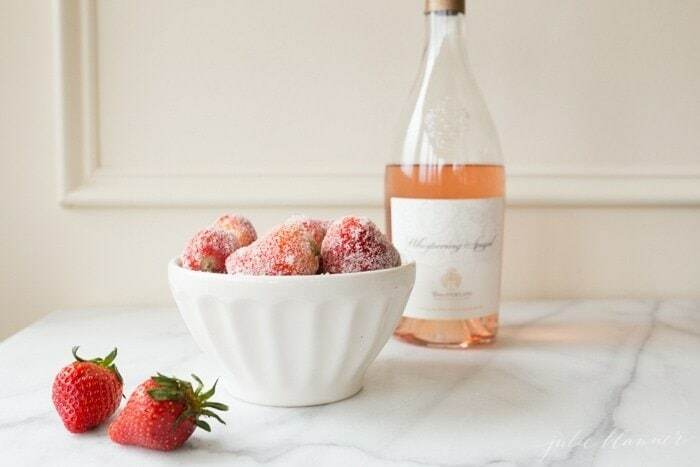 Ever since I’ve enjoyed the occasional glass and have begun experimenting with it making these pretty sugared rosé strawberries, rosé slushies and even using it in lieu of pinot for my reduction to top desserts. 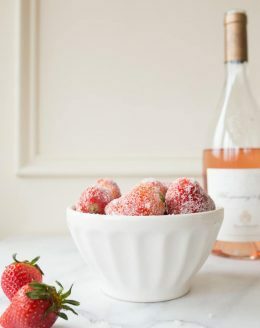 These marinated Rosé Strawberries, or Drunken Strawberries as I like to call them, are easy to eat. They’re the perfect summer poolside treat or addition to an Oscar watch party and Valentine’s Day, of course! Whatever the occasion, I hope you enjoy them, too! 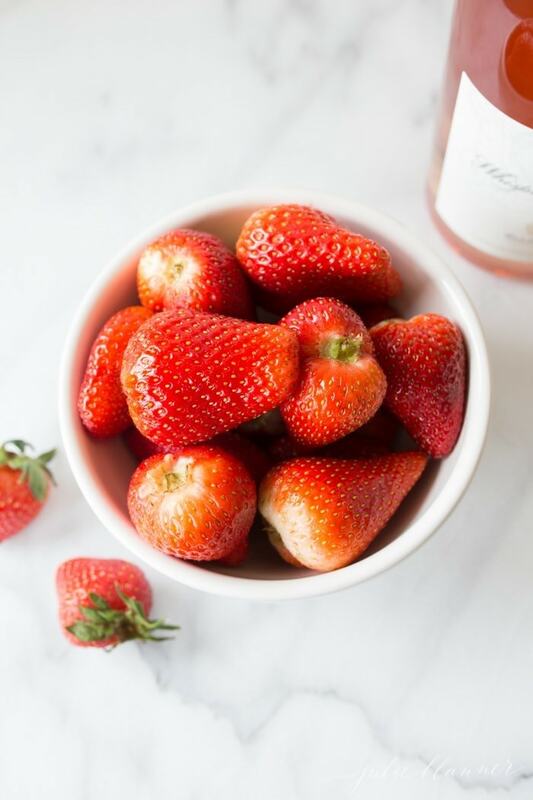 This easy drunken strawberries recipe makes a great poolside treat, but are perfectly poppable for showers, New Year's Eve, brunches and more! 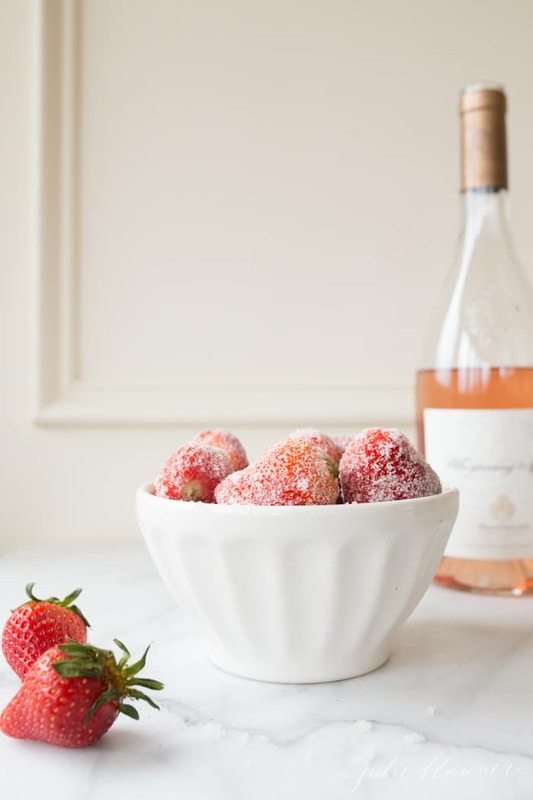 Place strawberries in a bowl, cover with rose and refrigerate up to 1 hour. 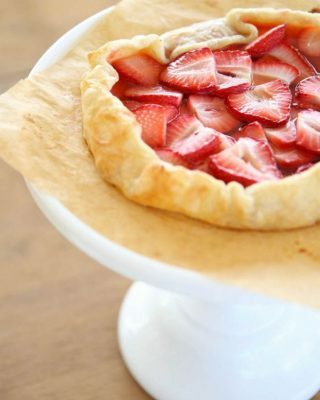 Drain strawberries and lightly dry them. 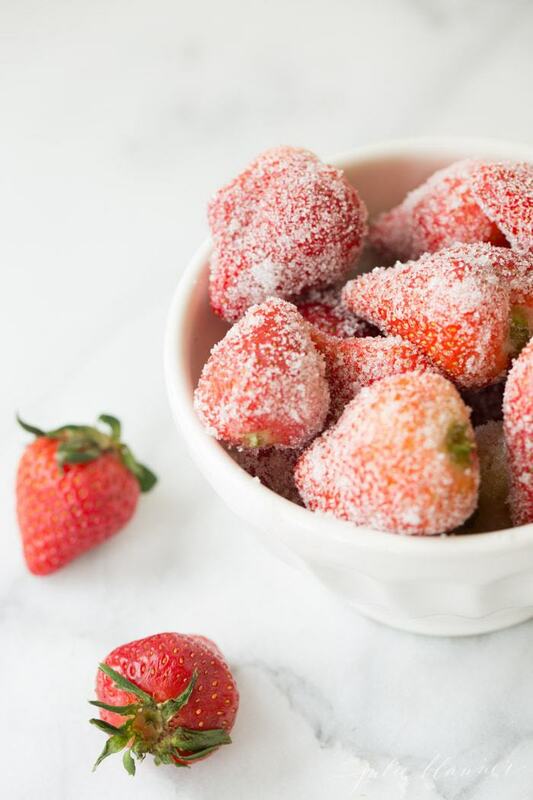 Roll in sugar and freeze until you're ready to enjoy. Whoa! 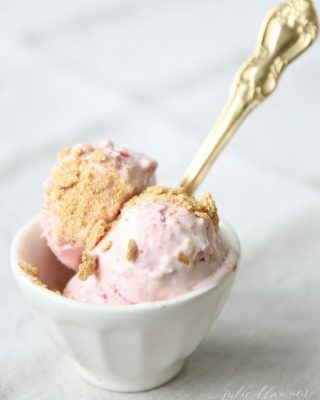 i didn’t knew you could use strawberries for this! i am so in love with the idea of this! Thanks for sharing your recipe! Yum! These sound awesome! The biggest problem I’d have, though, is keeping my kids away from them. The littles love berries of all kinds and can’t be trusted around them. Definitely keeping this recipe for summer vacation! These were such a delicious treat! These are delicious! I put them on skewers to serve. 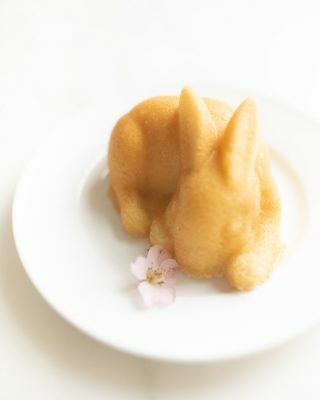 This is the CUTEST Valentine’s Day recipe I’ve ever seen! So delicious! How long do you sit them out before serving since you freeze them? I’ve made these twice, once with a sweeter rosé and once with a dry rosé. Both were good, but I definitely preferred using a sweet wine. I made these Memorial Day weekend and they were a hit! These were SO good! It was like my favorite childhood treat, soaked in wine! Thanks for another great recipe! I like to keep this in my freezer for a little treat after a long day at swim practice with the kids. Such a clever idea Julie, will definitely try this recipe! Can’t wait to make these this summer! This recipe tastes and looks great! 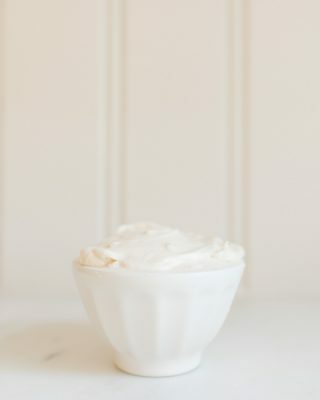 I’m going to make this for a sweet NYE treat! Delicious .Can’t wait so long to prepare it. Tonight.. Will post the picture once prepared. Thank you! I hope you enjoy them, too!